Following my recent post on Tara Scott, I received several questions about exercise frequency. As mentioned in the original entry, Tara has exercised daily for over 2700 consecutive days. At age 46, she is in tremendous physical condition. She possesses a rare mix of strength, flexibility, agility, and more. Unfortunately, after sharing her story, it appears that some readers confused the message behind it. I do not share stories of this nature with hopes that everyone will copy what they see. I am certainly not suggesting that one must train every day of their life. 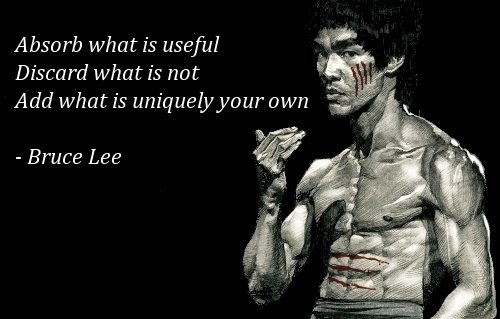 Instead, when witnessing an athlete such as Tara, it is wise to fall back on Bruce Lee’s classic advice. The true value behind Tara’s story is witnessing how she embraces movement. The body is designed to move. We were not intended to be sedentary creatures. Tara is not running herself into the ground. Instead, she does what she enjoys. She embraces her body’s natural tendency to move and remains active by balancing intensity. She adjusts her workload according to feel. She listens to the feedback that her body provides. There are hard days, light days, and others that land somewhere in between. Clearly, it is not necessary to exercise each day. It is however useful to be reminded of the human body’s potential for movement. It is also nice to see someone who enjoys her work. Far too many people have been fooled to believe that exercise is only useful when you are beating yourself into the ground. Tara proves otherwise. I highly doubt that anyone would remain so consistent without true passion for movement. As for finding your ideal training frequency, there isn’t a definitive answer that can be applied to the masses. As discussed previously, answers regarding frequency depend on several factors (ex. volume and intensity). Personally, I do not pay attention to days on and off. I enjoy training so I strive to move each day. I approach every day as a new day however, where decisions are made based on the present not the past. If I feel run down, I back off. If I feel fresh and strong, I push myself accordingly. I’m always willing to make adjustments if and when necessary. In summary, embrace the body’s natural tendency to move. Exercise and movement should not be loathed. You will naturally perform more often (and better) when doing something you enjoy. Personally, I love training. I’d much rather lift than sit in front of the television. I also enjoy the outdoors. If I am feeling run down, I’d rather take a brisk walk outside instead of sitting idle on the couch. The combination of light movement and fresh air will often recharge my batteries more than any recliner. Once again though, it is important to make individual decisions based on how you feel. Find what works for you. There will never be a singular approach that works for all. Great advice. For years, I went on avoiding things like cardio and simple fitness exercises because of my mission to add mass. It made me miss out on a lot of things that I enjoy quite a bit now. Due to incorporating some of these things into my program now, I would say that I pretty much workout every day of my life now too. I can also say that I probably never over-train my body due to this schedule. I really can’t believe you have to keep repeating this Ross. WTF? I love it Ross! Couldn’t have said it better myself, and I love the quote at the end from Carl Jung. 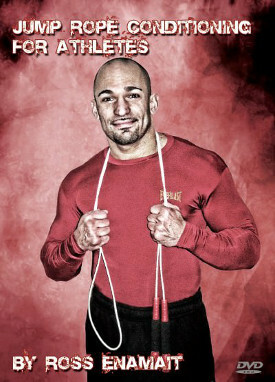 I think back in the day or at least in bodybuilding circles they called it “instinctive training.” teehee. You really do have to LISTEN TO YOUR OWN BODY. I always did best training my whole body 2-3 times a week as far as the weights go, strength wise and for building mass. As far as bodyweight exercises and running, I’ve experienced with daily training and every other day, but as you stated “intensity” is the key. Often I think the training programs of “athletes” or others is often way over exaggerated. Personally I question Herschel Walker’s “numbers” and others. There is a series of vids on Youtube titled “Ric’s Corner,” anyhow Mr. “Ric” was a bodybuilder and pro wrestler who lifted with Arnold and the boys back in the day. “Ric” explained that Arnold and others never lifted the type of weights “regularly” that they would be lifting for magazine photo shots, he stated that most of the time the bodybuilders would be lifting “relatively” much more modest weight. Regarding Coach Tara, are those legitimate kettlebells she’s using in her “kettlebell video?” I still can’t get over how easy she lifts those “relatively” large looking kettlebells. I can’t really judge kettlebells by weight by looking, but they look like 70-88lb kettlebells, and she’s performing with them like they weigh about half that. Wonder if those are “props?” Still what an incredibly fit woman. Have you ever practiced or trained guys involved with military based hand to hand combat systems like Krav Maga? Are these effective for self defense or is just a good MMA type of training regimen good enough? Honestly there does not seem to be much knowledge out here in he strength and conditioning realm in relation to more exotic hand to hand systems like Krav Maga or Dim Mak. I met an MMA coach from Detroit who said Dim Mak (Asian death touch) was real and worked but I’m skeptical any readers thoughts who know about all these more exotic flavors of hand to hand skills would be enlightening as these don’t seem too common. Almost any style can be effective, but you need to find a quality instructor. Often times it is the instructor that matters more than the style. Consider your previous question about boxing as an example. There are some TERRIBLE boxing trainers. You won’t learn anything that would help you inside or outside of the ring. It all depends on where you train. That’s why it is important to get opinions from others in your area. Word of mouth is the best form of marketing, particularly when dealing with a local product/service. It won’t take long to determine who is legit and who isn’t. I agree with you it’s about variety. I learned from an former NFL guy about mixing it up. He did it all from burpees to p90x to 5×5 to sprints to brisk walks to 3 on 3 basketball to football games in the park. For many cardio can get boring. I find I have to change it up every two weeks- ill swim in a lap pool or do basketball or go to Zumba classes or do burpees or walk in the park or walk and then do a set of burpees every 10 minutes while on a brisk walk or do stair drills or use an elliptical, hit the heavy bag, do minute drills, etc. Ross is right sometimes a nice walk in nature is needed especially when lifting heavy and/or doing minute drills regularly. Personally, I get burnt out going anareboic every day- I like every other day. As I’ve seen alot of respected trainers say, quality means more than quantity. With that said, I always like to at least get out for a run or game of football even if I’m taking the day off. It does wonders for my daily mental state. Good stuff Ross. To Eric- her kettlebells are competition, or sport style kbs which are all the same size regardless of weight. Promotes consistent swing technique, grip etc. Usually they are color coded to denote weight but hers have been painted. Hope this helps! at 62 years of age ,i train with a 54 year old female that at one time was a couch potato and never exercised…we work in the same bldg. and word got around about my weird( weird?) exercise advice i would hand out if someone asked me what i did to achieve my mini silverback gorilla persona.none of these people seemed to like my answers except the woman who eventually wound up being my training disciple/partner.as an ex footballer, judo ,wanna be boxer,pro wrestler,highland games guy and also much time spent training with noted jkd guys..it became apparent that the methods used to condition and strengthen for these activities were amazingly the same.bodyweight,jungle gym,indian clubs,maces ,kettlebells ,sandbags,stairs,animal crawls can be used for any sport or just conditioning for the ‘zombie apocalypse’..i always tell my workout partner..’if your not getting strange looks..you may be on the wrong path! !”…in the ‘fight game’boxers,mma guys,judo, grappling etc.jkd..none of these people pursue the mystical martial arts. as sifu larry hartsell told a group of us at a seminar( he was a boxer,judo and grappling master) in ‘total expression’ they only teach what really works in ‘reality’..no ‘dryland swimming’..thanks for the great site ross!!!!!!! !